Celebrating Health Cares About Domestic Violence Day! Today is Health Cares About Domestic Violence Day! For the past 15 years, FUTURES has leveraged this day to draw attention to the serious health impacts of domestic and sexual abuse. It’s an opportunity for domestic violence programs and health centers to shine a light on the important role the health care community plays in addressing and preventing intimate partner violence. While doctors and nurses routinely screen for high blood pressure and high cholesterol, too few screen for domestic and sexual violence. Medical studies link long term effects of domestic violence and abuse to a number of health problems—from diabetes and obesity, to substance abuse and eating disorders. The financial impacts of domestic and sexual violence are astounding as well—with costs exceeding $5.8 billion each year. There is, however, much more work to be done! Share graphics and information over social media! 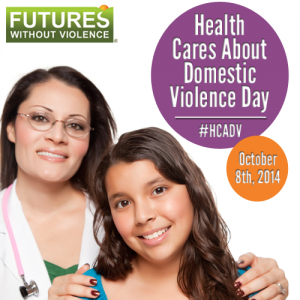 Check out our Action Kit for sample tweets and Facebook posts using #DVAM and #HCADV. Collaborate with a local DV agency to hold a community awareness forum or DV101 training at the health center. Find your local DV agency here. Find more ideas on our Health Cares About Domestic Violence Day Action Kit!